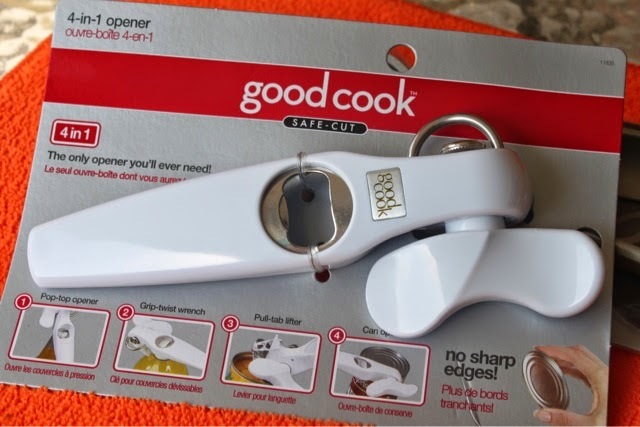 As part of the Good Cook Blogger Outreach Program, I received the five items shown above to test in my kitchen: The smart scoop, an easier way to handle those stubborn cartons of ice cream; egg separator to assist with your baking needs - no need to pop another yolk; utensil pot clip so you won't have another spoon floating in your sauce pan or dropped on the floor like I tend to do; flip measuring spoon to make sure you get out every last drop; and the 4-in-1 opener, otherwise known as the last can opener you'll ever need to own. You, too, can have a chance to build your own kitchen drawer. 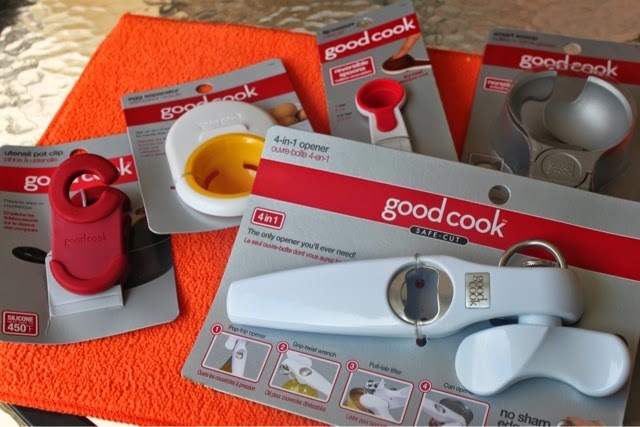 From June 2-7, 2014, stop by the Good Cook's Facebook page for your chance to win your own drawer full of gadgets. Also, visit the Good Cook web site for other chances to win! The web site giveaway runs through July 14, 2014. In this post, I chose to highlight the 4-in-1 opener. Until I met my husband 20 years ago, I had always used an electric can opener. When we met, he had a manual can opener and I had to learn to use it. I've never looked back and have used manual can openers exclusively since then. I've had many versions over the years and was excited to see this arrive on my doorstep. It was so easy to use that I actually didn't think it was working. I didn't see the top of the can opening so I thought I was doing it incorrectly. No, this can opener was actually cutting away the lid so there were no sharp edges. The whole lid lifted off instead of the inside of the lid. I loved it! One of the things that always bothered me about can openers is that they sometimes cut the labels and little specks of paper fall into your food. That won't happen with the 4-in-1 opener. This is a 4-in-1 opener because not only does it open cans, it also serves as a pop-top opener, a grip-twist wrench, and a pull-tab lifter. I will be using this gadget for many years to come. Good Cook asked me to share with my readers one of my favorite one part meals. If you're like me, you've grown up eating boxed meals. As a cook, I've tried to steer away from those meals but still get a hankering for some of the flavors from my childhood. 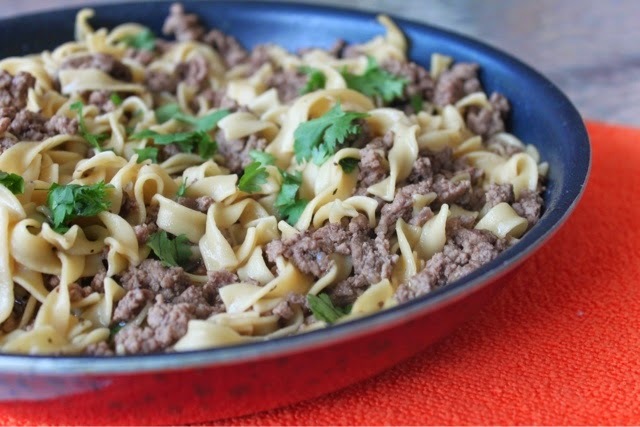 One of my favorites was a boxed Beef Pasta dish that I've recreated outside of the box. Optional: chopped cilantro, parsley, or green onions. 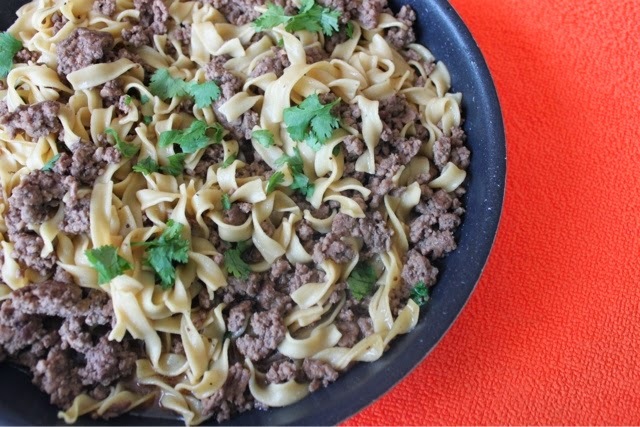 In a medium skillet, cook ground beef until brown. Drain grease and return to skillet. Add the next four ingredients and stir to incorporate into meat mixture. 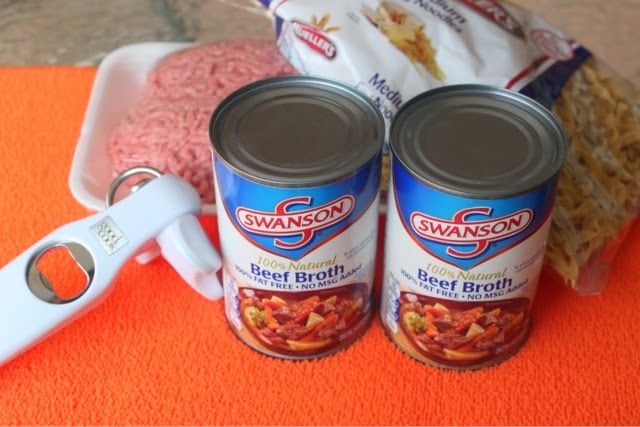 Add both cans of beef broth and bring the skillet to a boil. Once mixture boils, add in the egg noodles and lower heat to medium. Cook for approximately 15 minutes until noodles are tender. Remove from heat and let dish set until the noodles absorb most of the liquid. Sprinkle with chopped herbs or onions if desired. Serves 4-6. Disclaimer: Good Cook provided me with products to review for this post; however, the opinion expressed here is my own. That does look savory! What a great week night meal! Your casserole looks really yummy! I love dishes like this!! Thank you for sharing it!